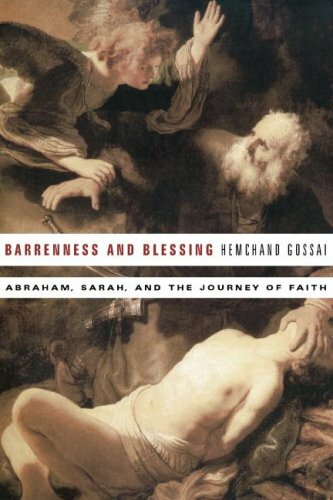 Hemchand Gossai, Barrenness and Blessing: Abraham, Sarah, and the Journey of Faith (Eugene: Cascade Books, 2008). xiii + 122 pages. ISBN: 978 1 55635 292 8. Review copy courtesy of Wipf and Stock. In this book, Hemchand Gossai, the Director of Religious Studies at Georgia Southern University (USA), invites us to look carefully at the Abraham narratives and to see therein the interplay of human drama and divine involvement. As we do so, he suggests, we discern the strengths and frailties of human being: ‘the possibilities and shortcomings, the persistence of faith together with moments of challenging doubts’ (p. xi). The story, Israel’s story, our story, begins with barrenness for that is how and where God chooses to begin, and out of which blessing and fears, fulfilment and challenges, complexities and struggles are given … and hope. Gossai reminds us of God’s decision to begin – ‘unafraid’ – with Sarah’s barren womb. Barrenness, he writes ‘is established as a possible place for yet another starting point for newness. Barrenness also poses for the human being a challenge to believe beyond what is immediately apparent … Barrenness ultimately leads to resignation and to the belief that the present reality is the way things will always be, and there is no vision for the unfolding of a future beyond one’s capacity to see. Thus, hope dies in the face of barrenness. The challenge of barrenness then is not only to accept a particular reality of the present, but also to imagine that it is not the last word, that the final word is yet to be spoken and eventuated’ (p. 1). Gossai explores themes of barrenness in the Genesis narrative – in body and land – as a point of ending and beginning, of hope born out of hopelessness. From Sarah, Rebekah, Rachel and Hannah, we see that barrenness is the ‘norm for God’, standing in marked contrast to human ways of ‘launching newness’ (p. 6). From Genesis 11, 25, 27, 16 and 19 Gossai reflects on this divine comma across human experience which threatens to make casualties of patience and hope. His treatment of the account of Sarah and Hagar in Chapter Two is particularly powerful, bringing the narrative to life, in the harshness of the wilderness. He notes of Hagar: ‘Even the displaced will have a future, born out of suffering and exile’ (p. 26). What we have as Genesis 18 comes to an end in a moment of disbelief on the part of Abraham. His fear of God’s anger as he expresses his view in 18:32 is more a recognition that he cannot finally fathom God’s capacity for forgiveness and grace. Whereas he began by challenging God on the basis of God’s justice and righteousness, he ends by essentially acknowledging his human limitations, and in an extraordinary moment, it is Abraham who ceases to press God’s mercy, and the dialog of questions and answers comes to an end. Throughout this “wrestling” for the sake of the unrighteous, God’s repeated pronouncement of God’s latitude of grace and forgiveness is made without any asterisks or footnotes. There is no hedging on the part of God. What is extraordinary here is that Abraham dares to challenge God. We have to be careful here not to immediately conclude that whatever is asked of God will be granted. That kind of simplistic and, I believe, unhelpful theology is not what is at work here. As I read and reread this text, I return to the issue of “what if.” What if Abraham had really “pushed his luck”: and had asked God if God would save the city for the sake of one righteous person? What if! This it seems to me is the question that naturally leads one to see the self-evident answer generated through Jesus Christ as the one righteous one who is enough to save all humanity. While from a literary perspective, the Abraham episode should not to be read and understood principally through these christological lenses, in my posing the question about the limits of God’s mercy and forgiveness in Jesus Christ, the resounding answer is that it is infinite-costly and infinite. Abraham, like us, finds it perhaps impossible to conceive of divine love, mercy, and forgiveness, which stretches beyond human capacity to imagine (pp. 50-1). Moving in-between narratives along thematic lines, and drawing not a little on Brueggemann’s work, Gossai proceeds to consider Genesis 32 (‘Refusing to Let God of God’) the story of Israel coming into being through pain and struggle, ‘and Israel will limp for the rest of his life with a blessing’ (p. 61). Genesis 12:1-4, Genesis 20, Genesis 21, Genesis 32-33, Genesis 25:19-34, Genesis 26, and Genesis 27 are all carefully attended to. As we arrive at this juncture in the narrative, particularly as this story follows the drama of Genesis 21 and the long-awaited birth of Isaac, any careful reader would immediately be shocked by the unexpected circumstances and developments. Few of us are able to read this story and not wonder silently or aloud if this journey to the fulfillment of God’s promise to Abraham (Gen 12:1-4), after all this time and after all the angst, has been for naught. Will not the prospects of Isaac’s death bring Abraham and Sarah again into a state of barrenness, similar to their state in Genesis 12, except in this instance with substantially more pain, even as their future disappears? Far too much is riding on this moment for it to be recast using empty religious rhetoric and vocabulary. As if a textual reminder that we cannot possibly know the future, this test of Abraham comes unannounced. The reality is that we could not have seen this event coming. There is no indication in the body of the story up to this point that hints that such a test could be possible, yet in what is already an extraordinary story comes this truly extraordinary development. We could not have been less prepared. But herein lies a fundamental direction in this broader Abraham narrative. It is finally about hope; hope in the face of such utter hopelessness and barrenness that nothing but unimaginable faith in a future over which there is no human control will maintain hope. So, then, why should we be surprised? Yet, we are, and we should be surprised. None of this is clear. Not all will rest comfortable with some of Gossai’s theological commitments, and while at times he invites an unnecessary (even forced) psychologising of the text, and is sometimes too anxious to find contemporary correspondences (see, for example, p. 61), his attempts to assist these ancient texts to speak again – and speak again to the church – is commendable and he offers much that is of considerable help for the preacher. I look forward to preaching through Genesis.